Departing from City Airport Manchester (Barton), The Blues Experience helicopter ride tracks over several of Manchester’s famous landmarks, including the home of Manchester City Football Club, City of Manchester Stadium, also known as Eastlands and/or the Etihad Stadium, on a tour of approximately 20 minutes / 33 miles. The flight path and order of landmarks enroute may vary due to the wind direction or be curtailed due to Air Traffic restrictions on the day, as this flight takes place in controlled airspace – we cannot go where we want when we want! Departing from the airfield it is possible to see the area of Salford Quays, which is one of the first and largest urban regeneration projects in the UK following the closure of the dockyards in 1982, redeveloped by Urban Waterside under the Salford Quays Development Plan. Manchester Docks was made up of two sections, Salford Docks (the larger of the two) and Pomona Docks. At their height Manchester Docks was the third busiest port in Britain. The Docks declined during the 1970s and closed in 1982 due to containerization and a limit put on vessel size to travel on the Canal. Substantial new development and redevelopment around Salford Quays means there are landmarks such as The Lowry Hotel, Imperial War Museum North and Media City UK to spot in this outstanding one square mile. The flight also tracks partially along The Manchester Ship Canal which was built as an inland water way tracking 36 miles long, starting at the Mersey Estuary near Liverpool where along its path several sets of locks lift the vessels up 60 feet up to Manchester where the dockyards were built. In this area you may also see land marks such as the Trafford Park, the world’s first planned industrial estate and currently the largest in Europe along with the impressive Intu Trafford Centre being just 5 miles west of Manchester City Centre, the second largest retail shopping centre in the UK, attracting more than 35 million visits annually. Situated to the side of the Intu Trafford Centre is the Chill Factor with the iconic and longest real snow indoor ski slope and resort in the United Kingdom. In this area, like it or loathe it you will also see the Old Trafford Stadium, the home of Manchester Utd. Close by is Old Trafford Cricket Ground the home of Lancashire County Cricket Club since 1864. Old Trafford is England’s second oldest test venue and one of the most renowned. The aerial panaroma of Manchester City’s ground soon comes into view enabling you to spot the distinctive, stylish and highly complex cable-stayed roof structure suspended by twelve exterior masts and attached cables. 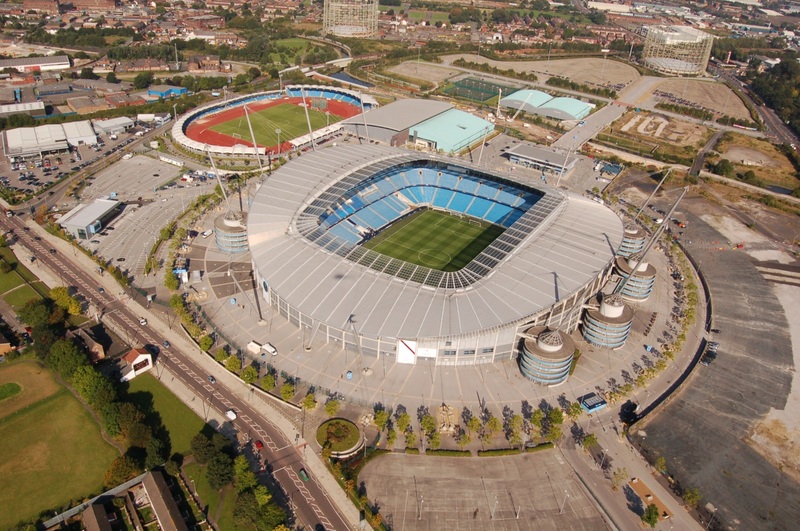 In 1998 Manchester City Football Club agreed to lease the stadium from Manchester city Council as a replacement for Maine Road. The stadium was used for the 2002 Commonwealth Games. It cost Manchester City £20 million and Manchester City Council £22 million to covert the stadium from a track and field arena to a football stadium. The club then moved to its new home in summer 2003. In March 2014 the stadium underwent new construction and expanded its size to have a capacity of 62,000. The expansion coincides with other developments taking place immediately adjacent to the stadium including the completion of the Etihad Campus training facility, Connell Sixth Form College and community hub which is partly funded by Manchester City. The stadium has also hosted many other sporting activities and music concerts over the years. Tracking back to the airfield Manchester’s important sky line structures such as the Beetham and CIS Towers along with many others should be spotted on this spectacular urban tour. This pleasure flight make be taken on selected weekends. Please note, the Blues Experience flight takes place in a Robinson R44, 3 seater helicopter.